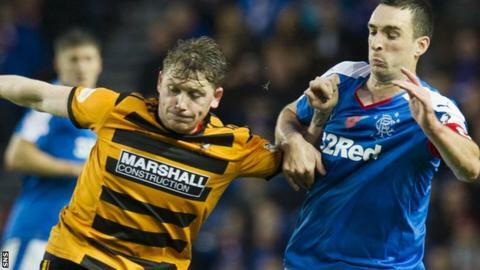 St Johnstone have signed former Alloa Athletic right-back Michael Doyle after captain Dave Mackay was ruled out for the rest of the season. Championship outfit Alloa this week added Ryan Finnie from Annan Athletic after Doyle rejected a new contract. Doyle, who joined the Wasps in 2011, had been poised to move to the League of Ireland to play full-time football. St Johnstone manager Tommy Wright said: "I know Michael well. He was about to sign for Cork City." Doyle, who began his career with Kilmarnock and had a spell on loan to Stirling Albion, joins the Saints squad for Saturday's visit of Scottish Premiership title challengers Aberdeen. "He wants full-time football in Scotland and this opportunity has come up at the right time for him," said Wright. "He's a good athlete and experienced and will give us good cover at a critical stage in the season." Mackay played through the pain barrier in St Johnstone's Scottish League Cup semi-final defeat by Hibernian on Saturday. However, the 35-year-old now faces more surgery on his hip after initially returning successfully from a summer operation. "Dave's been able to manage the problem since returning to action, but he has been in a lot of discomfort this week and so we sent him for further consultation and the outcome is that he needs another operation," added Wright. "He's looking at an absence of four to five months, so unfortunately his season is over. "I'm very disappointed for him because he put a lot of work into his recovery back in the summer and autumn." Wright is hoping chairman Steve Brown to give him some of the £500,000 the Perth club will receive from the sale of forward Michael O'Halloran to Rangers. Apart from Celtic, few Scottish clubs have been willing to pay transfer fees in recent years, but Aberdeen and Hearts were both been prepared to spend money to improve their squads during January. "I've spoken to the chairman about it and feel we need to be a bit more pro-active," said Wright. I'll try my best to get him to loosen the purse strings because it is getting tougher. "Ross County can go out and get David Goodwillie on loan - we couldn't afford that." Meanwhile, Alloa manager Jack Ross has turned to Scotland Under-19 cap Finnie to replace Doyle, who made 178 appearances for Alloa. The 20-year-old was coached by Ross at Dumbarton while on loan from Hamilton Academical before he won a move to Rangers. Finnie failed to break into the first team at Ibrox and subsequently with Partick Thistle. However, following trial spells with Dunfermline Athletic and Brechin City, he made 17 appearances for Annan after joining the League Two outfit in September.